TSMC HKMG is Out There! 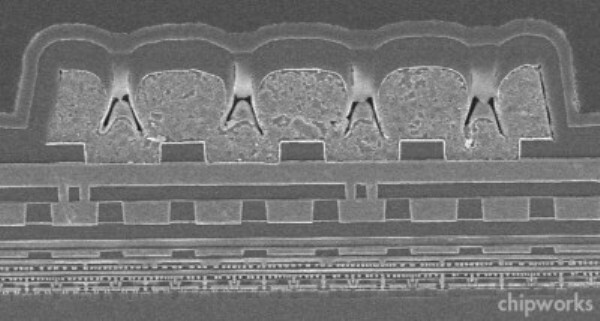 I have to apologise for a hiatus in posting due to pressure from the day job, but this week is Semicon West week, so it seems appropriate to announce that we’ve started analysing TSMC’s 28-nm gate-last HKMG product, in this case a Xilinx Kintex-7 FPGA, fabbed in TSMC’s HPL process. Having seen two generations of Intel’s HKMG parts (the 45-nm Xeon and 32-nm Westmere) using gate-last technology, it’s inevitable that we’ll compare those with the TSMC process. The Kintex family is the mid-range group in the latest 28-nm generation 7-series of FPGAs from the company. These are optimised for the highest price/performance benefit, giving the performance of the previous Virtex-6 parts at half the price. The Kintex-7 has eleven layers of metal (Fig. 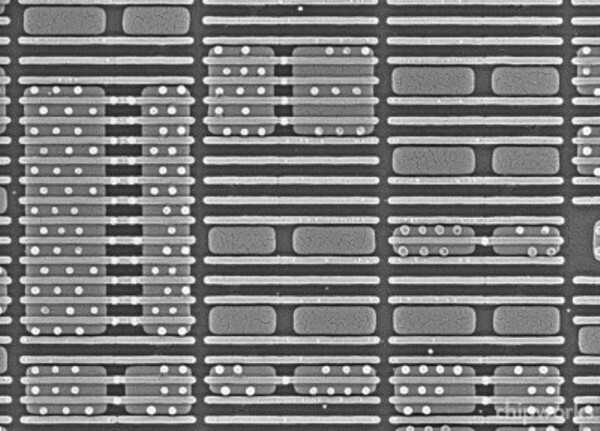 1); the 1x layers run from metals 1-4, with a pitch of ~96 nm, the smallest we have ever seen. Contacted gate pitch is ~118 nm in our initial analysis, with minimum gate length of ~33 nm, though since this is replacement gate there is no way of knowing absolutely the original poly gate width, which defines the source/drain engineering. Plan-view imaging (Fig. 2) indicates that TSMC has implemented the restricted design rules that have been much discussed in the gate-first/gate-last debate. Regular, uni-directional patterning of functional gate and dummy gate lines helps out the lithography, but inevitably reduces packing density compared with Manhattan layout schemes. By the look of it, double patterning with a gate plus a cut mask has been used. FPGAs are usually laid out in a more relaxed manner than dense logic, so here we can see lots of dummy gates, and also dummy active regions. The gate structure itself definitely has some similarities with Intel’s 45-nm, as we can see from figures 3 and 4. In both it appears that the buffer oxide, the high-k layer and a common work-function material are put down before the sacrificial polysilicon gate. Then the source/drain engineering is performed, and dielectric stack deposited and planarized back to the polysilicon; and the sacrificial gate is removed, and the NMOS/PMOS gate stacks are put in and planarized. Of course there are also differences – TSMC is not using embedded SiGe for PMOS strain, and there is an additional high-density metal layer in the PMOS gate. 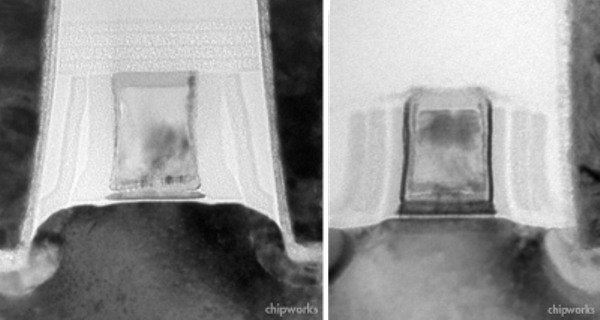 There is also no distinct dielectric capping layer in the TSMC structure, and there is an extra sidewall spacer (likely part of the source/drain tuning). The wafers are also rotated to give a <100> channel direction. 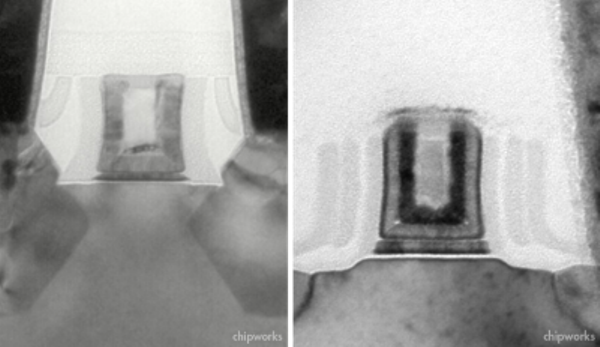 Intel stated that they applied stress to NMOS devices using the gate metal stack and the contacts; TSMC could be doing the same, although the contacts are spaced further from the gate edge. If there is PMOS stress, the mechanism is unclear, though it is possible that the extra high-density layer in the gate could be for that purpose. However, this part is fabbed in the HPL low-power process, and typically we do not see e-SiGe in such processes. Analysis is ongoing – more details to come, and possibly a comparison with the AMD Llano gate-first HKMG part, that’s in our labs at the moment. N.B. We are at Semicon West, at Booth 2337 – drop by and get a coupon for a free die photo! This entry was posted in Uncategorized on July 12, 2011 by insights-from-leading-edge.